Ontario’s two largest population centres, Toronto and Ottawa, are both working on elaborate tunnel projects intended to keep sewage overflow from spilling into local bodies of water. Toronto’s original sewer system dates back more than a century and was built with combined sewers that now serve less than 25% of the city, according to City of Toronto documents about the tunnel project. The stormwater runoff and sewage travel in one pipe and can be discharged, untreated, into local waterways during extreme rainstorms. The new $400-million, 10.6-kilometre Toronto overflow tunnel will serve as a backup for the Coxwell sanitary trunk, which handles 75% of the city’s sewage, and will be built along the Don River to stop combined overflows into 300 outfalls that lead into it, the Humber River and Lake Ontario during storms. Additionally, a new pumping station will be built at Ashbridges Bay, replacing two smaller, outdated pumping stations. Toronto’s overflow led to a 1987 joint commission between Canada and the U.S., resulting in the Toronto Harbour being one of 43 areas of ecological concern. Ottawa’s overflow tunnel project, meanwhile, will be more of a downtown venture. Costing an estimated $232 million, and running some six months behind its construction schedule, two tunnels will be designed to hold up to 43 million litres of surface runoff and wastewater and prevent it from entering the Ottawa River, according to City of Ottawa documents about the project. The interconnected tunnels, which run east-west and north-south, are 6.2-kilometres in length, and three metres in diameter. The tunnel boring machine (TBM) for the project has been specifically designed to cut through solid rock at a pace of roughly 20 to 25 metres per day. 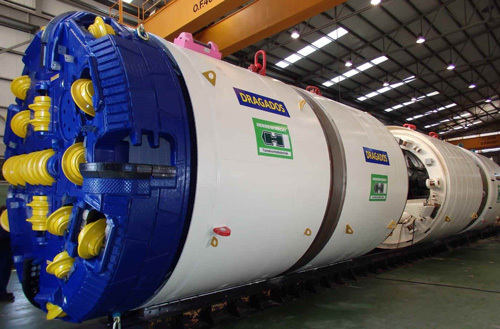 In 2016, Dragados Tomlinson Joint Venture was selected as the construction team to build the Combined Sewage Storage Tunnel. In Portland, Oregon, a similar technique was used for the construction of their storage tunnel. A video about this project and further explanation of this technique can be found on the City of Portland’s website. In the last week of July alone, 340 million litres of diluted sewage wound up in the Ottawa River. Toronto’s ongoing overflow tunnel project is more complex than Ottawa’s, as it consists of several infrastructure projects over 25 years to the tune of $2 billion. This includes the Don River and central waterfront wet weather flow system, new outfall, and a UV disinfection wastewater treatment system and integrated pumping station for the Ashbridges Bay Wastewater Treatment Plant; the Ashbridges Bay Landform Project and site of the future high-rate treatment facility; as well as pumphouse park usage and upgrades. Once completed, the City says the projects will “virtually eliminate the release of combined sewer overflows into the Lower Don River, Taylor-Massey Creek and Toronto’s Inner Harbour. It will also provide erosion and sediment control in Ashbridges Bay,” according to City documents.